This epic overland adventure offers some of the best sights, sounds and experiences that Africa has to offer. In 42 days you will travel through almost half of the African continent, climbing mountains, visiting waterfalls, crossing deserts and soaking up sun on the beach. 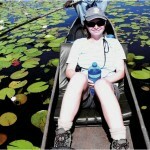 There will also be opportunities to camp in the bush, and boat down the Okavango Delta. Starting at the southernmost tip of South Africa, in Cape Town, before travelling up and across to the east coast in Kenya, the journey is full of colour, laughter and culture. Previous participants have described it as the journey of a life time, and we personally believe it to be one of the best ways to see Africa. Project Type: Overland Tour – 42 Days. Location: South Africa, Namibia, Botswana, Zimbabwe, Zambia, Malawi, Tanzania and Kenya. Pick Up Point: Cape Town, Castle Street. Start Dates: All year round, contact us for full list of start dates. Accommodation: Camping, Bush Camps and Hostel Accommodation. Meals: Meals as indicated in Itinerary. Leaving Cape Town we make our first stop at Table View and take photos of Table Mountain from across Table Bay. On the way to the Cederberg we visit !Kwa ttu where we enjoy a San guided tour & museum visit. After the tour, lunch will be prepared and afterwards we continue to our campsite in the Cederberg region. We arrive at our accommodation and your guides will give you a full briefing on the tour. An early start, we head north via the distant town of Springbok, best known for its diamonds, copper and spring flowers. We then proceed to our camp located right beside the Namibian border. The camp is situated on the riverbank that forms the border between South Africa and Namibia. Meals Included – Breakfast / Lunch and Dinner. This morning there’s the chance to see the beautiful river valley by canoe or just relax at camp. After lunch we cross the border and travel to the Fish River Canyon. After a scenic walk along the edge of the canyon we enjoy our dinner while watching the sunset. This is also a fantastic photo opportunity. Optional Activities at an Additional Charge: Half-Day Canoe Adventure. 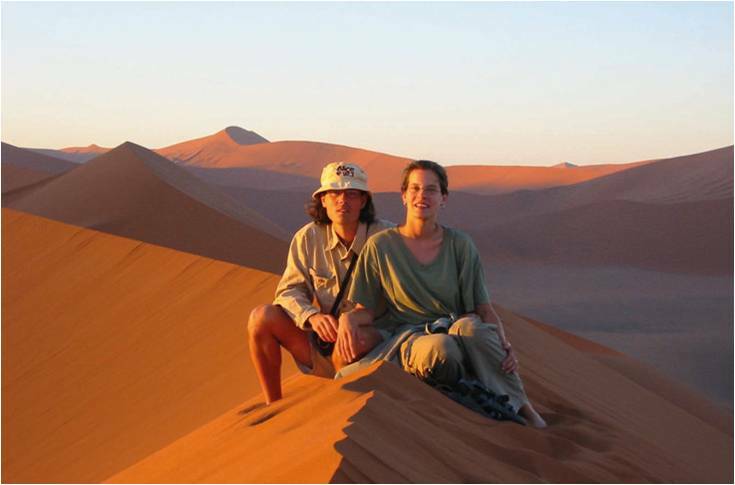 We arrive at the Namib-Naukluft National Park and set up camp, then enjoy a short hike into the Sesriem Canyon. Tonight enjoy the star-studded sky and enduring silence of the Namib Desert, only occasionally interrupted by the call of a Jackal or, a rather unique lizard, the barking gecko! This is our earliest morning as we prepare for our hike up Dune 45 to marvel at the sunrise. 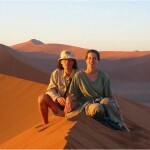 After our hike, we will have the chance to visit Sossusvlei. Later, we join a local expert on a guided hike and learn more about the unique desert ecosystem and how the bushmen survived in the harsh desert conditions. After a brief photo stop while crossing the Tropic of Capricorn, we travel onto Namibia’s Atlantic coast and the adventure capital, Swakopmund. Often there are flamingo’s at the Walvis Bay lagoon, just before we arrive in Swakopmund. You will be briefed on the many optional activities available here and then there is time to explore the town before dinner out at one of the local restaurants. Optional Activities at an additional charge: Dinner out. Meals Included – Breakfast and Lunch. The whole day is free to relax, explore or partake in one of the many activities available here. Most popular are Quadbking in the Dunes or Tandem Skydiving. On a clear day’s skydiving you can see all the way to the next day’s destination! Taking a walk around Swakopmund’s shops and having a leisurely lunch is also a great way to spend your day. Optional Activities at an additional charge: Quad biking, Sand boarding, Sky Diving, Dolphin Cruise, Scenic Flights, Fishing, Dinner out etc. Leaving the coast we drive through arid landscapes to the Spitzkoppe Mountain. The enormous granite monoliths dominate the otherwise flat landscape and we set up camp in the wild plain at the base. This afternoon our guide will take us on a guided walk to explore the unique rock formations. The more adventurous among us may want to try some mountain climbing behind camp for some stunning views of the landscape. After some early morning exploration we continue north and drive towards Kamanjab. Today we have the chance to experience life within a Himba tribe. The Himba are a pastoral people and predominantly breed cattle or goats. They are easily recognisable by their unique style of dress. The Himba have been extremely diligent about upholding the roots of their culture, but they are also very curious about visitors to their home. Etosha is the venue for some of the most unique game viewing experiences in Africa. 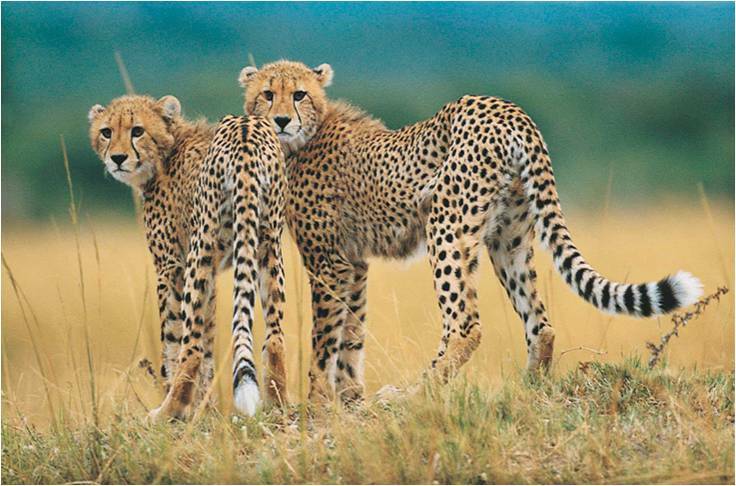 The sparse grasslands allow great opportunities to see animals normally hidden in dense vegetation. You may even see some of the amazing animals crossing the road in front of your truck! We will go on various game drives, and spend our evenings at the abundant water holes for some excellent game photography. Optional Activities at an Additional Charge: Night or Dawn Drives in safari vehicles. After an early morning game drive we set off towards Windhoek, the Capital city of Namibia. On the way we stop at a popular craft market where you can barter for handmade gifts to take home. Windhoek is not only the capital; it is also the cultural, social and economic centre of the Namibia. On arrival in Windhoek our guide will take us on a short city tour in our truck. Joe’s Beer House is an exciting dining experience for our optional dinner out. Optional Activities at an Additional Charge: Dinner out. Our journey takes us from Ghanzi towards Maun. Maun is the gateway to the Okavango Delta and this afternoon we will prepare for this excursion, packing small 2-night bags. There may be an opportunity this afternoon to visit the local crocodile farm or take a scenic flight over the Okavango Delta. Optional Activity at an additional charge: Crocodile Farm visit, Scenic Flight. This morning we board the big 4×4 truck that will take us in to the Delta. In high-water season it is sometimes necessary to take a boat to the poling station where we meet up with the members of a local community who will be showing us their homeland. 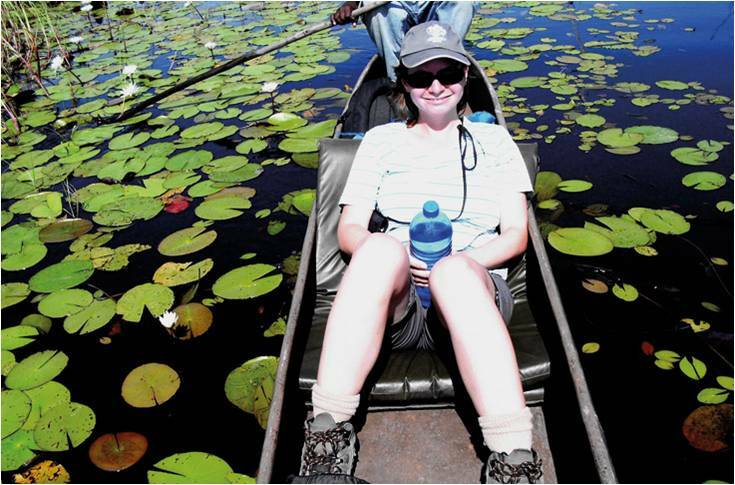 We spend 2-nights bush camping in the wilderness and, if the water level allows, we will take a mokoro (traditional canoe) trip through the waterways. We will also be going on some nature walks in the hope of seeing some wild animals in their natural habitat. We leave the Delta behind us and travel east to Planet Baobab. You can explore the bush around the campsite, lounge by the pool and view some of the region’s oldest Baobab trees. We travel to Chobe and this afternoon we enjoy a sunset river cruise, as the animals are best spotted from the Chobe River. Elephants, Hippo, Crocodiles, Eland and many other creatures reside in Chobe so keep your cameras ready. 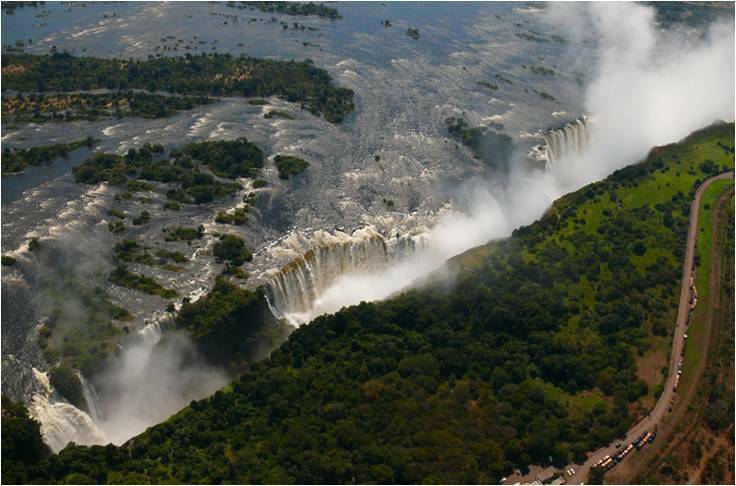 On arrival in Victoria Falls we have time to plan the next day’s adventure activities before we visit the spectacular Victoria Falls and experience the thundering of the mighty Zambezi. Optional Activities at an Additional charge: Chobe morning game drive, Zambezi Sunset Cruise, Dinner out, White Water Rafting, Bungee Jump, Elephant Excursion, Walking with Lions, Horse Riding and much more. Meals Included – Breakfast, Lunch day 19 only. 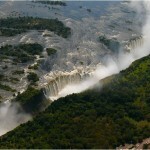 Leaving behind the natural wonder of Victoria Falls we begin our expedition. After Livingstone we journey towards the bustling Zambian capital of Lusaka. You will notice the vegetation becoming sub-tropical and the roads a little rougher. Meals Included – Lunch and Dinner. Today is a long drive through lush country, crossing rivers en-route to Chipata, the gateway to the South Luangwa National Park. Zambia is truly African and an adjustment from the more Western ways of Southern Africa. Early in the morning we drive from Chipata to the border of the South Luangwa National Park where we spend the next two nights right on the banks of the Luangwa River. You can often see hippos and other animals from the camp bar. This afternoon we enjoy a sunset game drive in the South Luangwa National Park. In the morning you have the opportunity to take another game drive. The park is known for its high concentration of leopards and hippos. After lunch we visit the community run tribal textile project and a local village. Optional Activities at an additional Charge: Morning Game Drive and Game Walk. Today we visit the Lilongwe Wildlife Centre, Malawi’s only sanctuary for rescued, orphaned and injured wild animals. The Centre is set in 180 hectares of beautiful woodland, Lilongwe’s only protected wilderness. This morning we have the opportunity to participate in a 2 hour city tour, before we take a scenic drive to Kande beach. We will spend the next 2 days enjoying the many optional activities available, such as horse riding and different water sports. We will go on a guided village walk in order to meet the local people and learn more about Malawian life. 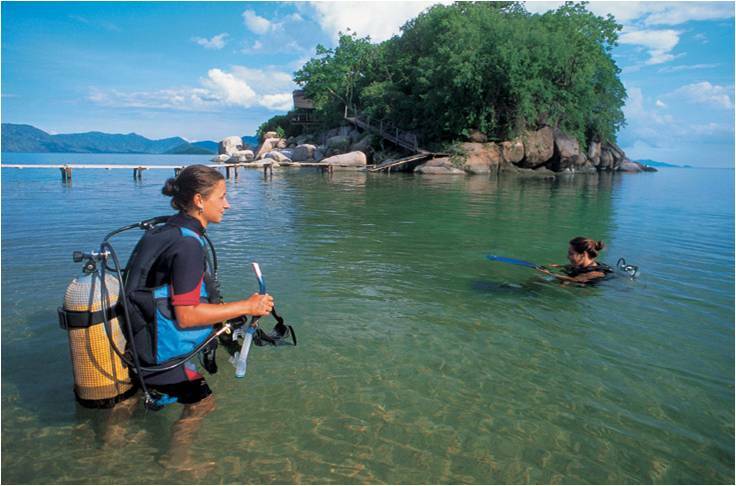 Optional Activities at an Additional Charge: 2 hour morning city tour in Lilongwe, Water Sports, Horse Riding, Craft Shopping etc. We travel further north and spend our last day in Malawi at Chitimba beach. For those who have had enough of the beach, there is a short hike to the Manchawe Falls. 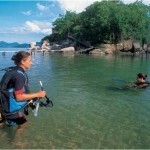 Optional Activities at an Additional Charge: watersports, abseiling etc. Today we leave Malawi and enter Tanzania. We ascend out of the Great Rift Valley through some spectacular mountain passes, passing vast tea plantations in the highlands before arriving at our camp outside Iringa. This evening our dinner is in a local Masai Hut where we enjoy a traditional Tanzanian evening. We leave Iringa today and head north to the Mikumi National Park. Mikumi is home to lion, zebra, wildebeest, impala, buffalo and elephant and today we have the opportunity to enjoy an optional afternoon game drive through the park. Optional Activities at an Additional Charge: Afternoon game drive in Mikumi National Park. 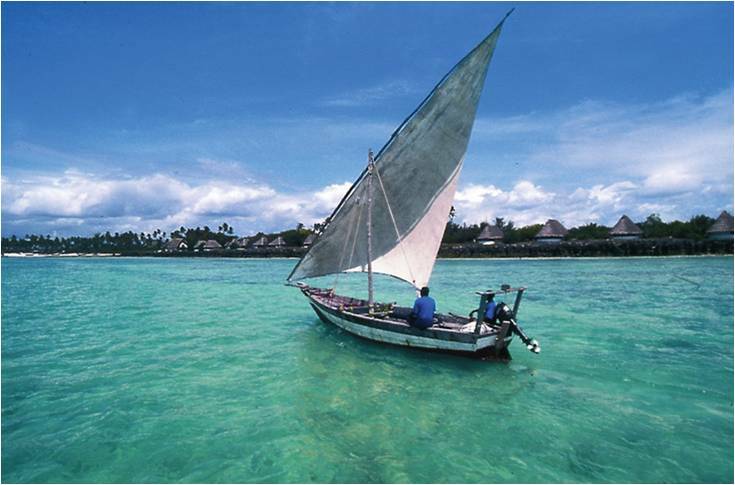 Our journey today brings us out of the cool highland region to the humid Indian ocean coastal city of Dar es Salaam. Meaning ‘house of peace’ in Arabic, Dar es Salaam is the economic and trade capital of Tanzania, but inland Dodoma remains the official capital city. A local ferry will take us from Dar es Salaam (where we leave the truck) to Stone Town, the capital of Zanzibar. We spend the first night exploring the historical and unique architecture. There are also spice and seafood markets to be explored. The following day we take a transfer to the northern part of the island where we will spend our time relaxing on the beach. Optional Activities at an Additional charge: Lunch & Dinner, Swimming with Dolphins, Scuba Diving, Snorkelling etc. 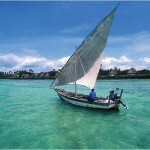 Today we leave Zanzibar and catch a ferry back to Dar es Salaam and return to our truck. We continue on to Lushoto, the major town and district centre, albeit small, in the Usambara Mountains, halfway between the coast and the parks. The popular pot plant Saintpaulia has its only wild occurrences in Tanzania, and particularly in the Usambara Mts. Here you will have the chance to hike in the surrounding area, or just relax. Today we take a scenic drive via Arusha to the picturesque town of Karatu. The area’s cool climate, verdant hills, and pleasing views made it popular with settlers and farmers. Vast and extensive fields covers the slopes of the volcano and the lands around Karatu town. Karatu is also a stone’s throw away from the world famous Serengeti & Ngorongoro Conservation Area. 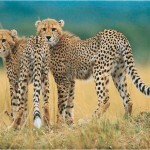 These 4 days are set aside for the optional 3-night excursion into the Serengeti National Park and Ngorongoro Crater. This area has one of the most densely inhabited large animal populations in Africa. The excursion is in open topped 4×4 safari vehicles in order to tackle the challenging side roads in the parks. For those not going to the parks, take this chance to absorb some of the fascinating local culture. Optional Activities at an Additional Charge: Various Serengeti & Ngorongoro Excursion packages, Lake Manyara game drives, day hiking & village tours, volunteer at educational project and many more various day trips. Today the group meets up again and we have the chance to exchange stories of the various adventures that we participated in over the past few days. In the afternoon we visit the local Masai Mara Museum and Snake Park in Arusha. Optional Activities at an additional Charge: camel ride to local Masaai village. After crossing the border into Kenya we continue to travel towards Nairobi and the end of our journey. Usually we end the tour with a group meal out at one of Nairobi’s excellent restaurants. Optional Activities at an additional Charge: Dinner out. Kwa Ttu San Experience, Guided desert walk with local expert, Himba Tribe visit, 3 day Delta drive in, Chobe National Park boat cruise, Victoria Falls National Park entry, South Luangwa National Park Sunset Game drive, Textile Village visit South Luangwa, Village tour Malawi, Zanzibar excursion plus ferry, Masai Museum, Arusha. South Africa, Namibia, Botswana, Zimbabwe, Zambia, Malawi, Tanzania and Kenya. Malaria prophylactics are required. Very low risk of malaria in northern Namibia, but the risk increases to high risk as we travel north to Zimbabwe and East Africa. 8.00 am from Nomad Adventure Tours, 39 Castle Street, (Corner Castle & Burg Streets), Cape Town, South Africa. Tel: +27 (0) 82 578 2199. The Meridian Court Hotel, Muranga Road, Nairobi, Kenya. Tel: +254 20 313991. All clients require adequate Travel Insurance. Please note that these are your responsibility. Some nationalities require visas for Namibia and Botswana. Most nationalities will require visas for Zimbabwe and East African countries. Although most nationalities can obtain their visa on the border we prefer that you obtain it before arrival to save time at immigration when crossing from one country to another. Visas for Malawi are not obtainable at the borders. The African sun is very strong. Please use a factor 30 sunscreen and wear a hat. You should drink at least 3 litres of water per day to avoid dehydration. It can also get very cold during winter months on this route. South African Rand and US Dollars are the most widely used currency on this route. USD (United States Dollars) is the best currency for East Africa. Botswana, the Pula is the local currency. You can change your Rand or Dollars to Pula when you enter Botswana. ATM’s do not always work in Botswana. Credit Cards cannot always be processed – especially in remote areas. Travellers Cheques can take a long time to change into cash and often incur unreasonable charges. USD Notes printed before 2004 (i.e. the old style notes) will not be accepted and many places will not accept USD100 notes, so make sure to bring lots of $1, $5 and $10 notes for tips and craft markets. USD20 and USD50 notes are good to change in to local currency. A Yellow Fever Certificate is required for this tour. If you require accommodation before or after your tour we can arrange this for you. We can also arrange airport transfers. Southern / East Africa: In general tipping in restaurants is expected and is around 10% for good service, more if you have received exceptional service, and, feel free not to tip at all if you received poor service. Tipping taxi drivers etc is really at your own discretion 18 and not always expected. If in doubt please ask your guides. It is expected to tip Porters and Car-guards etc. Ask your guides how much is appropriate in local currency. Our crew can be tipped if you feel that they have done a good job and/or gone above and beyond the call of duty. We recommend USD1 (or about R5) per day per person, per guide as a fair tip. So if you have 3-crew on a tour, we would recommend that 3 envelopes are used and each crew member’s name written on one. Place what you feel is fair in to each envelope and give these to the crew at the end of the tour. If you do not feel that the crew deserve a tip, please, do not tip them. You must remember that tipping is only for exceptional service and is not at all compulsory or expected. As they say, it’s not the destination that matters so much as the journey itself, and that’s especially true on this overland Safari. Starting out in Cape Town, you move through mountains, rivers, canyons, and many of Africa’s finest national parks before finally arriving in Nairobi, one of Africa’s most friendly capitals. The 42 days allocated for your journey means that there’s plenty of time to stop, relax and take in the incredible sights that Africa has to offer. Break days are included throughout the safari, giving you the opportunity to explore the surrounding area at your own pace. There are options for everyone, with the option to relax at restaurants and quiet fishing spots, or more extreme options (skydiving, quad biking etc) for the adrenaline junkies in the group. Once you move away from the coast that you can really start to experience all of the landscape and variety Africa has to offer. Travellers will have the opportunity to visit nearby tribes, and gain an insight into their culture and how they live. Bush camping is also an integral part of the journey, where some of the best memories are made. One of our locations, the Okavango Delta, is a world heritage site home to some of the worlds most endangered species of large mammal, including cheetah, white and black rhinoceros, African wild dog and lions. Some of which you will hopefully sight on one of the guided walks through the delta. Later on there is also the option to delve into the Ngorongoro crater on a 3 night excursion, which boasts one of the densest populations of large animals in Africa. Whilst on safari you will spend time under the stars in both established campsites and bush camps along the trail. The campsites along the safari are relatively basic, and some do not have the full amenities, but they more than make up for their limited facilities with the incredibly African sky above. As well as camping, some nights there will be accommodation available, with home comforts like shower and kitchen facilities! From £2,390 per person sharing. Meals as indicated on the itinerary, accommodation, registered guide and transport. We also include some of the highlights as listed under “included highlights” in the tour itinerary.